This hand truck does what most think is impossible: it is going to help you move appliances up stairs. The 72” state-of-the-art StairKing Battery Powered Stair Climbing Appliance Hand Truck model has all the great benefits of the 66” model, with the added bonus of additional height. This hand truck’s carrying capacity is 850lb. Its cool running high torque motor gets more lifts per charge than a standard torque motor, and provides a steady and consistent power via its industrial grade gear box. It has an auto rewind ratchet system that works hard to help you manage your heavy loads. This hand truck’s polyurethane lifting feet will provide you with an incredibly secure move by gripping the stairs. Made from welded aluminum—the lightest structural metal—this is one of the strongest and most lightweight hand trucks of its kind. See the Accessories Tab to view detailed pictures of different available options. It is also available in a 66" height. 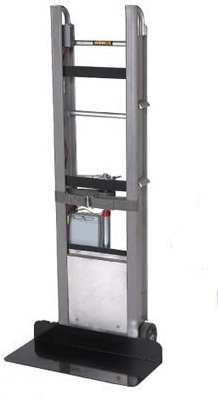 Have a look at more than 40 different electric stair climber hand trucks. Get the Wesco Stair King Today at Handtrucksgo's Best Price! This hand truck is simply amazing! What a back saver and it just has made all of my jobs much more efficient and SAFER! 1/2 horsepower, 50 amp, high torque motor runs cooler under load and gets over 80% more lifts per charge. 230053 67 lbs 800 lbs 25" 70" 30"
230055 18 lbs - 28" 4" 12"
260160 20 lbs - 20" 7" 20"
270076 19 lbs - 11.5" 4.5" 20.5"